Here it is! 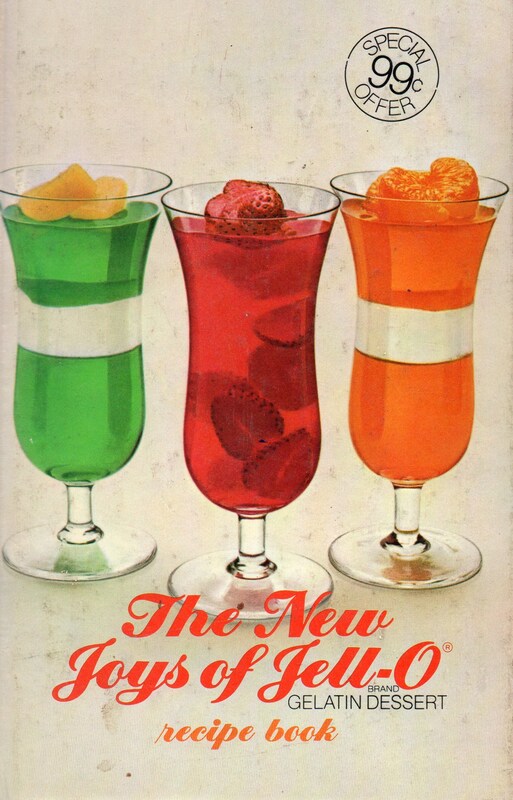 99 cents worth of Slightly-Creepy Seventies Jello recipes! Here’s a slightly creepy-seventies woman who was clearly the Martha Stewart Forerunner of the Slightly-Creepy Seventies. Notice how the Jello she is preparing with her little pretend son, exactly matches the wallpaper in the background. 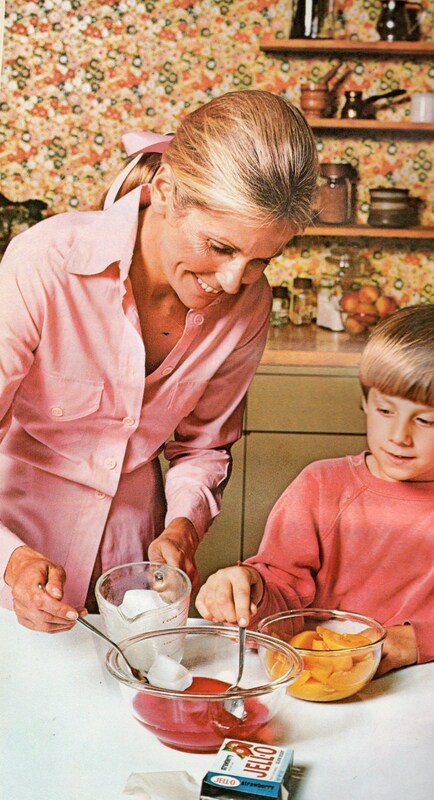 The real Martha Stewart was probably hiding in the closet with her Jello butcher knife (from a Jello mold she made herself) and, right after this picture was taken, bound and gagged the Slightly-Creepy-Seventies Martha Stewart Forerunner and locked her in the closet. I bet if we were to look in that closet today, we’d find Slightly-Creepy- Seventies Martha Stewart Forerunner still in the closet, mummified sure, but still there nevertheless. Ding Dong! It’s Slightly-Creepy Seventies Party Time! I’m sure it will come as no surprise to you, Dear Readers, that in the Slightly-Creepy Seventies, this is the kind of people who showed up on your doorstep to party. And, it will also come as no surprise to you that if you asked someone to bring “The Dessert” in the Slightly-Creepy Seventies, it meant that instead of bringing a decadent, seven-layer Bavarian Chocolate Cake, they would bring, instead, a big ol’ bowl of Jello! You’ve got to give this lady kudos, however, for rummaging around long enough to find something she could add to her Jello dessert to ensure that it would match her outfit. So what if she had to add a little of her husband’s black shoe polish? Who cares? Nobody’s going to eat any of it anyway because even if it is the Slightly Creepy Seventies, it’s still Jello. It’s quarter to 3 and no one’s in the place except you and me and Jello. Oh and her — whoever she is. 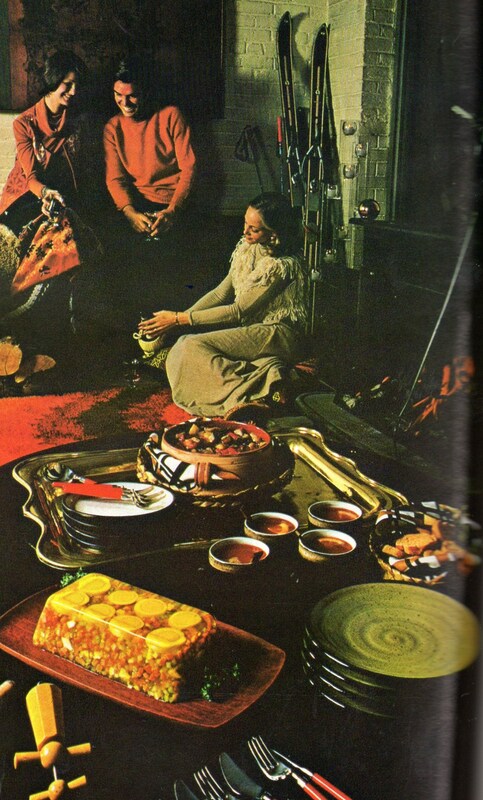 The same Sightly-Creepy Seventies party later that night. As you can see, even though the lady who brought the Jello has ditched her husband to flirt with a ski instructor (who just happened to bring his skis to the party), the hostess has turned down the lighting so no one will notice that her dress only matches one plate and zero Jello desserts. Don’t worry, even though she’s probably planning to chug that bottle of wine she’s holding, she’s only a tad bit suicidal. But then again who wasn’t in the Slightly-Creepy Seventies? Slightly Creepy Seventies Hip Intellectuals gathered to eat Jello! Here’s a group of Slightly-Creepy-Seventies intellectuals discussing Slightly-Creepy-Seventies issues such as atomized individualism, the Viet Nam war, and the efficacy of determining one’s emotional age by counting the rings on their platform shoes. As you can see, this party is a big hit because the hostess has wisely chosen an outfit that not only mimics the art of the successful Jello “layering” but also picks up all the colors in the Jello Buffet. 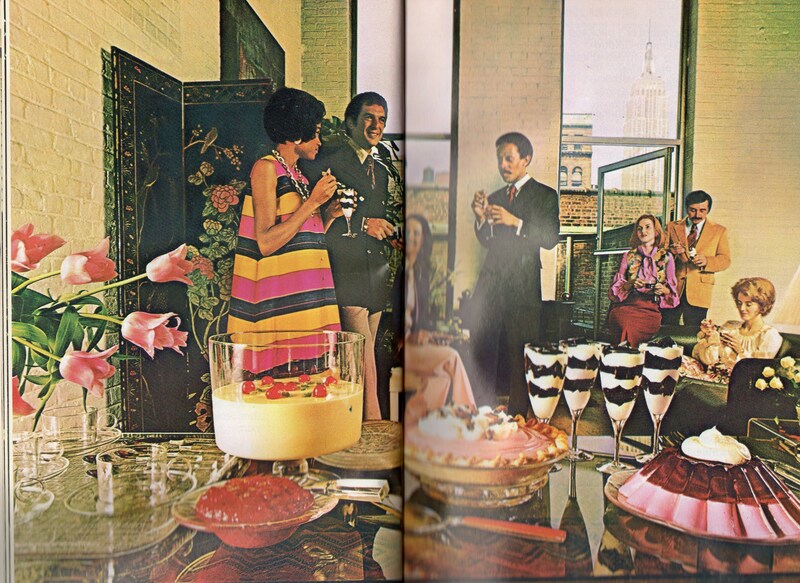 The woman sitting next to the open window, however, rather than being pleased with herself, is contemplating plunging to her death because no one is eating the Jello dessert she made. The very same Jello dessert she thought was so socially relevant when she took it out of the refrigerator — but now sees clearly that no one understood her nod to existentialism through disorientation and confusion in the face of the meaningless jiggling and wiggling. Oh, and pay no attention to the lady sitting on the couch crocheting. She’s an escapee from this 1984 crocheting post. She’s obviously running from post to post trying to escape the madness of the past. And who can blame her really? And there you have it, Dear Reader! I hope you were able to learn something about Jello’s influence on the decade of the Slightly Creepy Seventies and if you didn’t, all I can say is neither did I.